Our A.C.A. certified instructors will work with you as you learn the skills needed to safely paddle a kayak, one step at a time. Whether you're interested in paddling on flat water or braving the rapids, we have the program for you. See the Course schedule below for a date that is convenient to you. Call or e-mail us for more information or to schedule your own class. 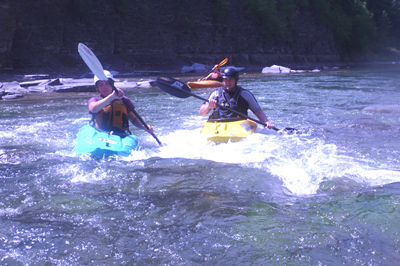 All of the scheduled classes are the ACA's "essentials of river kayaking" course and begin at 9:00 am. Please arrive at the ACO office by 8:30 am in order to prepare for the day. Class usually lasts until 5:00 or 6:00 pm. Call or e-mail now as the classes tend to fill quickly and the class size is limited. Cost: $105.00, includes all equipment needed. Or schedule your own class date! ACO is proud to support the Norse Paddle Company of Warsaw, N.Y. Norse manufactures high quality canoe and kayak paddles.